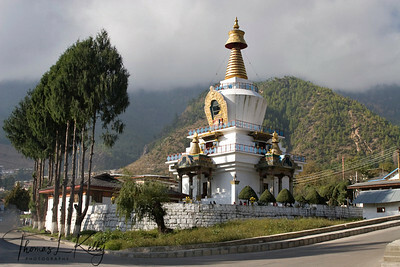 The Memorial Chorten, also known as the Thimphu Chorten, is a chorten in Thimphu, Bhutan, located on Doeboom Lam in the southern-central part of the city near the main roundabout and Indian military hospital. 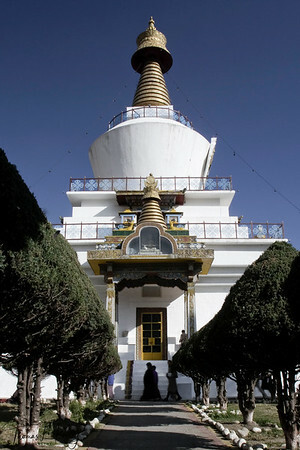 The chorten, built in 1974 to honor the 3rd King of Bhutan, Jigme Dorji Wangchuck (1928–1972), is a prominent landmark in the city with its golden spires and bells. In 2008, it underwent extensive renovation. It is popularly known as "the most visible religious landmark in Bhutan". It was consecrated by His Holiness, the Late Dudjom Rimpoche. This chorten is unlike other chortens as it does not enshrine the mortal remains of the late King. Only the King’s photo in a ceremonial dress adorns a hall in the ground floor. 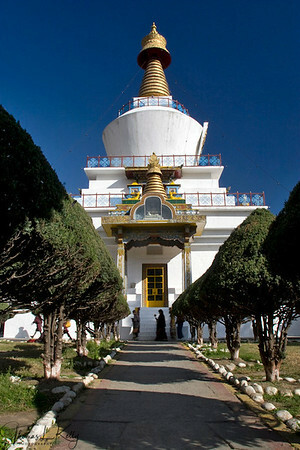 The King when he was alive wanted to build "a chorten to represent the mind of the Buddha". The Memorial Chorten. Thimpu Bhutan. 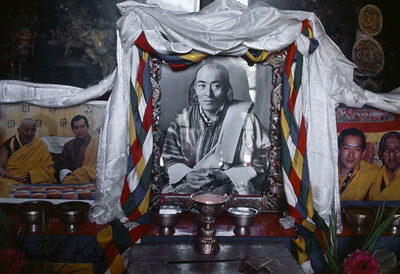 Memorial photo of the present King's father, Jigme Wangchuck, who became the second hereditary king of Bhutan. He ruled during the great depression and WWII, but these catastrophic world events did not affect Bhutan because of its barter economy and isolation. His Majesty Jigme Wangchuck refined the adminisrtaive and taxation systems and brought the entire country under his direct control. King Jigme Wangchuck died in 1952 and was succeeded by his son, Jigme Dorji Wangchuck, who had been educated in India and England and spoke fluent Tibetan, English and Hindi. His picture is seen to the left and right of his father. He constituted the National Assembly in 1953 and abolished serfdom in 1956, reorganized land holdings, created the Royal Bhutan Army (RBA) and police force, and established the High Court. To improve relations with India he invited Pandit Jawaharlal Nehru and his daughter, Indira Gandhi, to visit Bhutan in 1958. However, as he lad Bhutan into the modern world, he emphasized the need to preserve Bhutanese culture and tradition.